My wife called me and asked me to pop into Waitrose to get some organic food. As I was leaving, I walked into the wonderful new cafe area. I noticed someone dressed very smart. He was a fabulous gentleman dressed immaculately with a tie and a checkered blazer. He had a small white moustache and nicely combed hair. He looked like a very famous British TV personality from the 60’s, 70’s and 80’s – Alan Whicker. I thought, how nice to see a gentleman looking so dapper, and continued walking out to my car. As I sat in my Victor the Volvo, I could not get this man out of my mind. Who was this man, sitting there all alone? I had to go back. So, I went back to the cafe, bought a coffee and a posh orange cake. I felt so underdressed, without a tie and jacket. I knew then I was in for an interesting chat. The conversation with Bob was incredible and it went from the now to the 1960’s back to the 1930’s, then back to the 70’s all the way to his childhood, his wife Vera and daughter. He loved Radio 4 since his childhood. He recalled listening to Children’s Hour, at 5 o’clock every day, and the characters of Toytown like Mr. Mayor, Mr Grouser the Grocer who was always grumpy or Dennis the Dachshund and Larry the Lamb. As he remembered these Characters who lived in Toytown a tear came to his eye. Bob loved Children’s Hour and he said that back in the 1960’s his daughter would sit with him glued to the radio everyday. He said that the beauty of children’s radio is that you used your imagination to be able to “see” what all these characters looked like. ‘Why not bring back Children’s Hour?’, I said. I quickly went out to my car and came back with this little 40 year old book called Jolly Stories and my camera. Bob’s eyes lit up as I gave him the book. This confirmed to me that we are still all children inside, we just have these adult layers on where we have to hide our childhood. 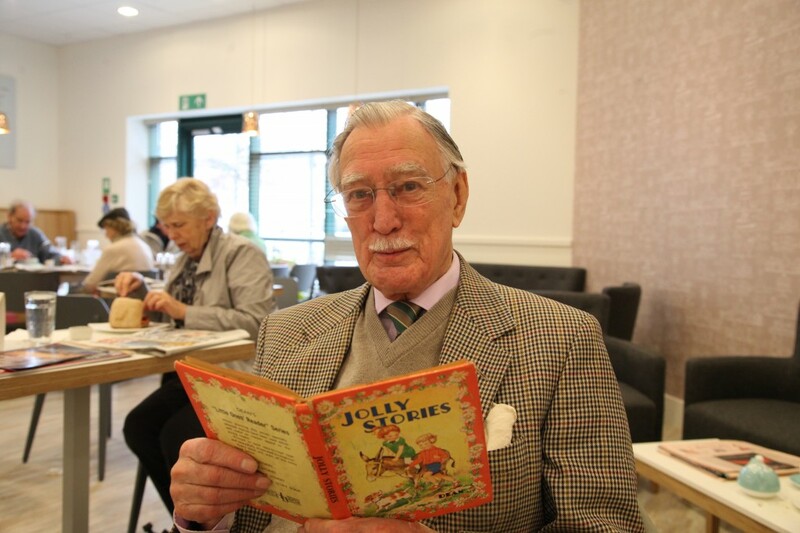 People like Bob are our walking libraries they have 90 years of wisdom and wonderful stories to tell. We have to document these people now. Once they pass away, those 90 years of memories will be gone forever. Bob was laughing as he read the jolly stories. I asked Bob what his childhood was like and he said: ‘Well, rather sad actually.’ What Bob told me next was something I could not quite believe. ‘I can remember my mother visiting me and I can still see her walking away.’ Bob then began to cry. Here I was in Waitrose hearing the most incredible stories from a man I just took the time to say hello to. He took out his handkerchief from his blazer to wipe his tears. Then he held my hand and apologized. Bob continued by saying that since he was in the hospital for 2 and a half years, his brother Jack was the kingpin at home. But, when Bob came back home, aged 5, he became the one getting all the attention. So, Jack became jealous and they never got on for 30 years. Despite that, Jack is now 92 and they are good friends. I asked Bob where he lived. What came as an answer took me by surprise. He said: ‘Well, near Lewisham. I have owned my house for 50 years. It cost me £275.00. My wife, Vera, was born in it and I bought it from my wife’s parents.’ She died 10 years ago so now he lives alone. I then asked what Bob’s earliest memories were and he said that his first one is from when he went to the hospital at the age of 2. I remember my father even wore a bowler hat to bring in the coal from the garden to light the fire to keep us all warm. Bob said oh how he just loved swimming and in his youth he was a champion diver. In the war everyone in the Bomber Command had to learn to swim, but many of them could not be bothered. They still had to pass the tests so, Bob and his pal would pretend to be other servicemen and take the tests for them. However, they got caught shortly. Meeting Bob has been wonderful. What a fabulous Saturday afternoon it had become for me. Such incredible stories he had about about the famous Mitford Sisters and even one about Hitler. What I have realised today is we have celebrate the older generation now, not at their funeral or obituary. I spent about two glorious hours with Bob and then I drove him home and we were giggling like children in the car talking about cartoons and children’s stories and characters like Top Cat. When we arrived at Bobs house he invited me in for tea and cake. How I love older people’s houses they always have special feeling of comfort and calm that lived in feeling I guess you can just feel the years of happiness maybe it’s a kind of goodness from the universe an aura of kindness that our elders homes have after years of them living there. May be it’s a unique kind of energy that is earnt from happy contented lives. As we drank tea from a big teapot Bob had more mesmerising stories about his life in fashion and his many holidays around Europe with his wife, he then suggested I come over to his house next week for tea and he said he would bake a lemon cake for me and my wife. So what an afternoon of pleasure and wonderful conversation I had all from a #justsayhello. How much more incredible could one day get? Bob was more entertaining then any celebrity chat show guest as are all the wonderful oldies walking past us all every day. All of our amazing older generation are bursting with amazing stories so I just simply cannot emphasise “Say hello there” to a fabulous oldie daily like I do myself Just like superstar Bob Woods when you say hello they will smile like a huge sunflower waiting to put a glow in your heart. Top tip if you find saying hello a little awkward just think of something nice to say a compliment about their clothes or shoes or if a lady say “wow” you look glamourous today and they will light up like a rainbow. Our older generation are waiting for you on every street corner to tell you about their lives. Just like Bob was #alone in Waitrose they are waiting for you every where. He truly made my heart so happy. What a day this was Thank you so much Bob. A true star you are. Come over and follow me on Facebook. That was a great story about man going into Waitrose. I might just try saying helli next time i am in Waitrose.and hope i make someone happy. I often give a smile to some elderly folk as they walk by.and they seem quite delighted! What a wonderful idea and it is something we can all take the time to do. Make a new friend! What an amazing story! Touched my heart on my birthday . Would it not be nice if every young person adopted a Senior as a friend. It will help to reduce loneliness and depression among our older generation and will most certainly help the young ones by dipping into that wealth of knowledge and experience that goes unnoticed.